Carbonite, an online backup service, is now available for the Mac. The service is priced at $55 per machine per year. A free trial is available. 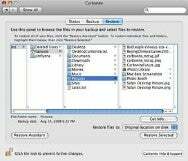 Carbonite enables Mac users to backup the contents of their systems whenever their Macs are connected to the Internet. The service provides unlimited storage capabilities, and can be automated for easy backup. The client software runs in the background, and continually backs up the computer’s files. It finds new and changed files and backs them up whenever you have a net connection — data is encrypted and transmitted to Carbonite’s data centers using HTTP (SSL). The software provides a preference pane that enables you to monitor what’s being backed up and how up-to-date the backups are. When you need to restore a file, you can recover it to the original location, the Mac’s desktop or another location. A “Restore Assistant” provides you with the ability to do a full restore if necessary. And Carbonite features the ability to access remote files from any Web browser, so you can restore files that are backed up from anywhere, without needing a special client. The software utilizes lossless compression and will automatically adjust bandwidth requirements to assist other apps running on the Mac. If you have multiple Macs sharing a single net connection, you can switch Carbonite to “low priority mode” to make sure it doesn’t interfere with other systems’ Internet usage. System requirements call for an Intel-based Mac running Mac OS X 10.4 or later.